I look at a girl who looks at the cats who look from left to right, from left to right, from left to right. The little gold cat paws go up and down in unison. The girl looks back at me mimicking the cats and I have to smile. I walk up to her and touch her hand. I call it her paw. It’s good luck, I say, to touch the paw of these cats. That’s why they have them in Chinese restaurants, they are supposed to bring you luck. Touch their hand as you walk out of the joint and you’ll have had a great meal and your next day will be even better. She looks at me and then looks at all these cats along the wall and then looks back at me. She goes cross-eyed and skips to the other room. It smells like a Glade plug-in and it’s giving me a headache. She’s only knee-high, this girl that I’m looking at who doesn’t like to look back at me without a silly face on. She’s taller than knee-high, actually, but she likes to crouch down to knee-high and jump out at me. I say: You can’t run in a museum. There’s that Steve Martin movie where he rollerskates through the art museum and I’ve always wanted to try that. I bet she would too, but I would have to buy her pint-sized rollerskates and those are expensive and she’d just grow out of them. I look at her and she looks at a painting of shapes and she looks back at me. She says: I could do that. I really could. I say: You can make a lot of money. She says: I’d buy ice cream and I would buy the right to eat it whenever I want. I say: That’s 100 dollars a night you would have to spend. That’s how much it costs to eat ice cream whenever you want. She skips away from me and goes back to the cats, and I am looking at her and the cats and I want luck. I touch her hand. She says: Let go of my paw. I want to touch the hands of these cats because I bet you that would help. I need luck. I want it. I sneeze into my hand and then wipe it on my jeans and then she copies me and she does a good job of it. She’ll probably grow up to be an actress. These cats, one of them would look good in her room. I want their ancient luck, the type of luck that will not only bring her back home to me alive every day, but also give her powers. The type of luck that makes her the pretty one, but not the stuck-up one. Maybe it will give her great grades, too. And she’ll always be on time. I want to stack the cards in her favor. 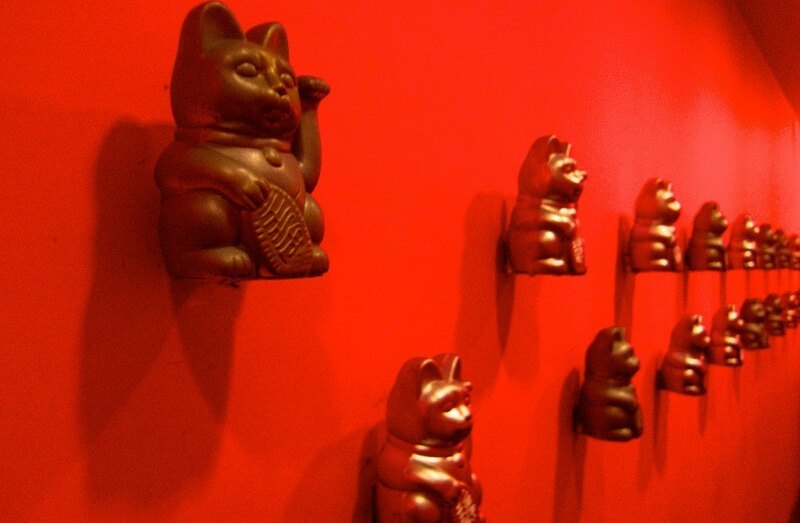 I look at the price of these golden cats and I think about the red wall behind it and I want to paint her room that color because it makes these cats looks how they should. They are rich, they are gold-plated, they would make life gold-plated; or, just gold, through and through. I hear her padding away and I see that she has taken off her saddle shoes and I want to give chase, so I do. I take off my shoes and we are off in the museum and we slide across the slippery wooden floor and run into walls and breeze past security guards who look like they are about to follow us, yelling. They don’t. They leave us for another security guard to catch in another section. I do a triple twist like I’ve seen with those ice dancers and she does the same thing. We softshoe together. I do that thing where I switch my knees and she watches, mesmerized. She asks: How do you do that? She giggles and runs off and then I see her stop and look up at a woman that I don’t know. The woman is severely dressed, in a blazer and matching suit pants and a severely white blouse. She holds the girl’s hand and looks at me. The woman asks: What are you doing here? The woman asks: Where are your shoes? The woman asks: Why are you alone with my daughter? This is the question that I will actually have to answer. The other two were warm-ups, but this last one is the one she wants to know the most. Me: I wasn’t going to take her against her will, but I was going to ask her to come along with me. I was going to buy her a slice of chocolate cake and I was going to steal one of those golden cats and I was going to put it in the car with us, for luck. I was going to shower her with love and affection and I would treat her with respect and we would change her name in every state. I would call her Blu-Ray and Alice and Doctor Fantastic. I didn’t have any plans after that, I was only thinking that she could really softshoe and I was having fun dancing with her. That’s really all. The girl: This man is funny. The woman (to her daughter): I don’t like when you wander off like that. I don’t want you hanging out with teenagers who skip school. And you know that people who smell like cigarettes are criminals. The woman (to me): You can leave now by your own accord or I’m calling the police. And then the woman in the blazer starts up the counting game. My mom used to play it. I know the rules. I don’t ever want her to get to ten. Posted on Sunday August 1st, 2010 Wednesday March 26th, 2014 by Max Elman. This entry was posted in Photos & Stories and tagged cats, iphone, kids, museum. Bookmark the permalink. Good picture, good story! Don't underestimate yourself Chris(topher). I really liked this one. Blu-ray is the best name for a child. this is curious and curiouser. i like it silly Christopher. This one creeped me out. What happens at ten?